These easy veggie bowls have both spiralized and chopped veggies, for a great texture. Seasoned simply and roasted, these bowls are perfect for meal prep and full of vitamins and nutrients. You may have seen my Roasted Veggie Bowls before, whether on the blog, on Instagram, on YouTube, or shared in a Facebook post. 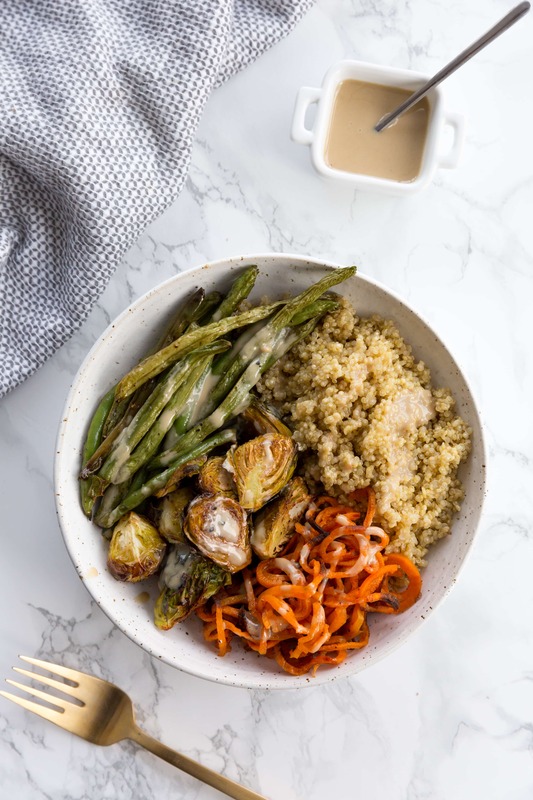 I’m always making my Roasted Veggie Bowls – they’re such a simple, tasty, and quick way to meal prep for the week. Essentially, you lay out a bunch of veggies, season them to your preference, and roast them together while you make a healthy grain to serve with them (I usually opt for quinoa or lentils for a protein boost) and serve with a drizzle of tahini and maybe some avocado for a healthy fat. Meal prepping these bowls usually lasts 3 days in the refrigerator, depending on how much I snack on the veggies during the week! For whatever reason, I haven’t made a spiralized version and since so many of you have been making roasted veggie bowls of your own, I figured it was time to make a true Inspiralized version. I always roast sweet potatoes in these bowls, but if you are using a different vegetable that can be spiralized (for example, beets or butternut squash), then spiralize accordingly. Then, it’s time to assemble. Easy as that! 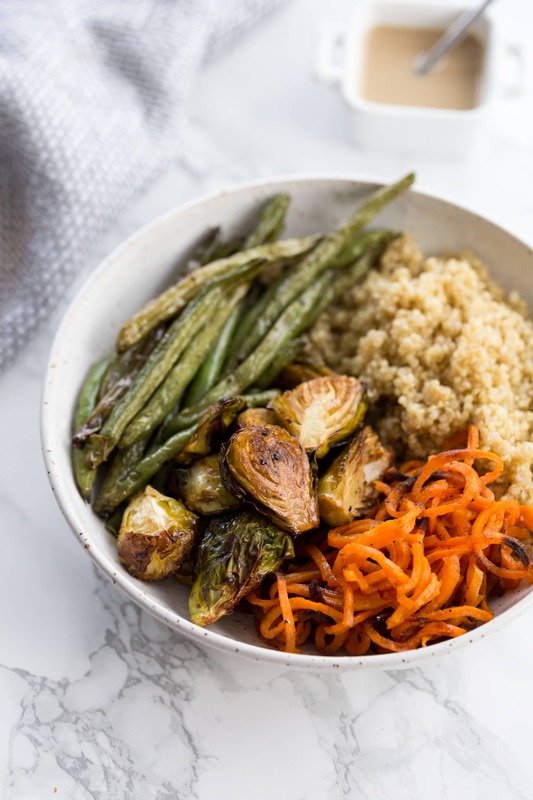 Meal prep these roasted and spiralized veggie bowls next time, instead of cubing everything! I know I will be! How do I reheat roasted vegetables? Place your roasted veggies in a skillet over medium-high heat and saute, stirring frequently, until heated through. Preheat the oven to 400 degrees and lay out your roasted vegetables. Let cook until heated through, about 5-10 minutes, depending on the desired temperature. Lay out the Brussels sprouts, sweet potato noodles, and string beans. Drizzle everything with olive oil and season with salt and pepper. On the Brussels sprouts, also season with garlic powder and lightly drizzle balsamic vinegar. On the sweet potato noodles, season lightly with paprika. Toss the Brussels sprouts together to combine with seasonings. Roast the vegetables for 25 minutes. Check the sweet potato noodles after 10 minutes. If they’re fully cooked, remove and place in a bowl or plate and cover to keep warm. If they’re still crunchy, toss, and continue to cook, checking in 5 minute intervals until they’re done – be careful not to burn. Assemble the bowls. 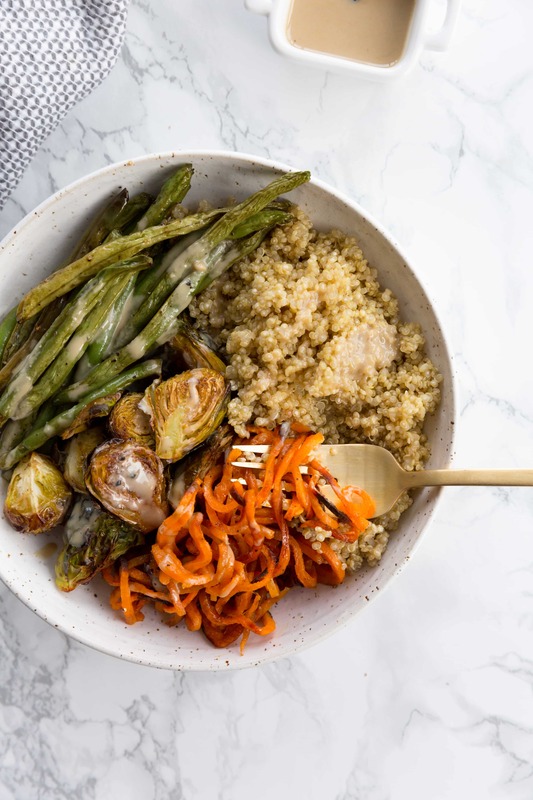 Divide the veggies into the bowls, along with the quinoa. Top with avocado (if using) and drizzle with tahini.